If you follow my Facebook page you got a sneak peek picture for this post. I was just too tired yesterday evening to write this. It has finally happened, the hardtop has made its way to the boat. The top has been ready for the move for a week. When I went to let the yard manager know we were ready, his initial response was that they were very busy and probably could not do it until after Christmas. This is the same guy that came to me a couple weeks earlier to tell me that they may have to move my work area because they needed the space for boats. Fortunately when we went back the next day we were able to convince him to try to fit us in this week. He said he would let us know when (we need a little heads up so we can take down the soft bimini and disassemble the work space tent). Since he said we could move into the slip we would use to place the hardtop at any time, we elected to move the boat over the weekend so we would be ready whenever they were (and also to make it a little bit harder for them to forget about us). Monday it didn't seem like the yard was too busy, the staff was engaged in winterization tasks and some small projects. One other boat owner in the yard was able to ask the lift operator to re-block his boat, and they did it within an hour or so of asking. Since the yard manager wasn't here, I asked the guy that would likely be running the equipment for my move if (or maybe I said when) they could get my top moved to the boat. He asked if first thing in the morning would work. Naturally, I agreed. And naturally, overnight the winds kicked up to 25 knots with gusts to 40 (enough to wake me up and send me out to check the dock lines at 2 A.M.). By the morning the wind died down a little, it seemed to be between 15 and 20 knots. Those winds still didn't sound like a good thing to be playing in when trying to move a 12 foot wide fiberglass Frisbee. So, we waited. We cleaned up our work area in the yard a bit, took down the tent and took down the soft bimini. Finally, around noon the winds died down into the 10 knot range and it seemed like a good time to try the move. The plan was to use the large forklift (a forklift with really long forks that used to be used to launch small boats). We would suspend the top by straps or lines underneath the forks. This way we could walk the top out to the slip, lift it over the arch, and bring it into position on the boat. Once at the boat I would cut some 2x4's to length to make supports to hold the top in place while we attach the back and have the welder measure and construct the front supports. The plan worked for the most part. Once we got the top out to the boat, one of the yard staff suggested we use boat stands instead of the wood as this would allow me to easily adjust the position of the top before mounting it. This turned out to be an excellent suggestion (thanks Kevin!). And thanks to the whole crew for the help getting the top moved and onto the boat. Getting the top positioned and adjusted was a bit tricky. The bolt locations and wire chase holes along the back edge don't leave a lot of room for error. Neither does the clearance for winch handles at the sheet winches and clearance for the boom up front. In hindsight, I probably should have made the mounting flange a bit larger, with the option to cut it down at the boat. In any case, I was able to get it positioned where everything worked. After getting the top positioned as best I could, I drilled the holes for the two outer mount points. Not an easy task given the angles. I ended up using a close-quarter angle attachment on the drill and drilled from the back side through the access points in the bottom of the arch. It made me a bit nervous, but I was able to get the holes positioned fairly well. I then used the 316 stainless steel hardware ( 3/8 bolts, 1.5 inch fender washers, lock washers, and nuts) I purchased at York Bolt* to temporarily bolt the top to the arch. 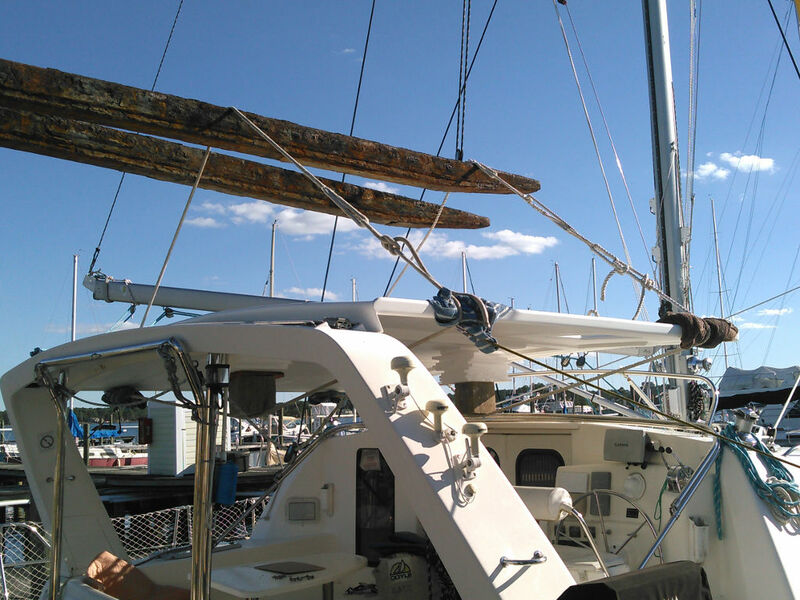 This, along with the boat stands and a line that looped around the top and is suspended by my main halyard, was enough to keep it secure for the night. Now I need to mark the locations of holes for the wire chases. Then I need to move the top so I can drill those holes, apply the seal to the arch, and cut some rubber padding spacers from a sheet of gasket rubber I purchased from Hampton Rubber* before putting it all back together and adding the remaining arch mounting hardware (additional bolts, including the ones that hold the blocks for the davits). 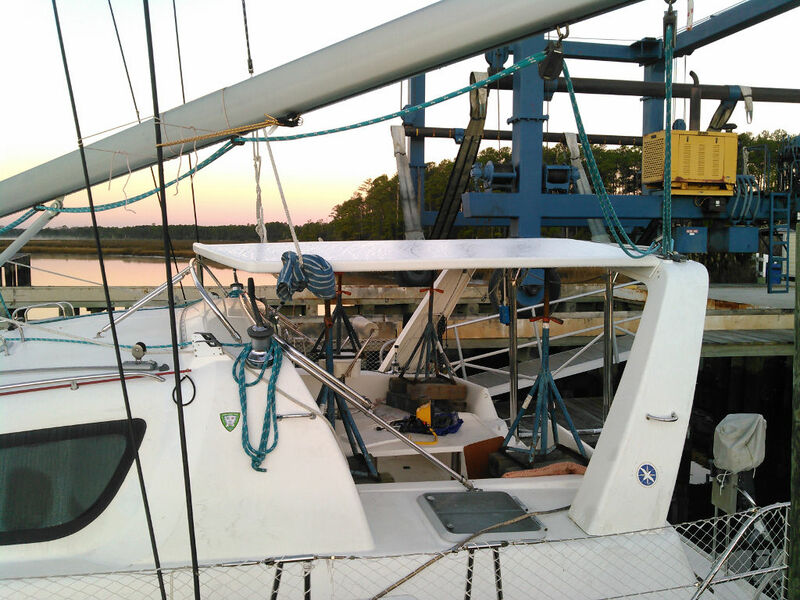 Then I've got to hire a welder/fabricator to make the front supports while we install the sail viewing window. Almost there...finally. *I'm working on a page of the companies I've found that provide marine quality materials at more reasonable prices. It is a work in progress, but you can check it out here (or from the "Better Marine" tab at the top of the page). Wow! Incredibly nice job Mike. I feel a bit like a proud grandparent after a particularly hard baby delivery! When you get down here we will lift a glass of champagne together. Thanks! Sounds like a good plan to me. It is looking great. There would be a lot of satisfaction in knowing that the two of you have done it yourselves. As Deb has suggested, it is certainly worth lifting a glass of champagne to toast its completion. After all the effort you have put in, each evening while you are relaxing having that mandatory sun downer somewhere in paradise, a smile will appear across your face as you look up and see the result of your work. Thanks buddy! Oh, we will celebrate its completion...just think we will wait for someplace warmer. It looks amazing! You've done a great job - you must be so happy to see it all come together. Thank you. There are a few minor issues with it (remember I'm a perfectionist), but overall we are quite pleased with the results. We are both happy and relieved that it has turned out well.